This edition of Mexican Weekend isn’t about celebration food. It’s about old-fashioned food. Comfort food. Peasant food, some might be tempted to call it. 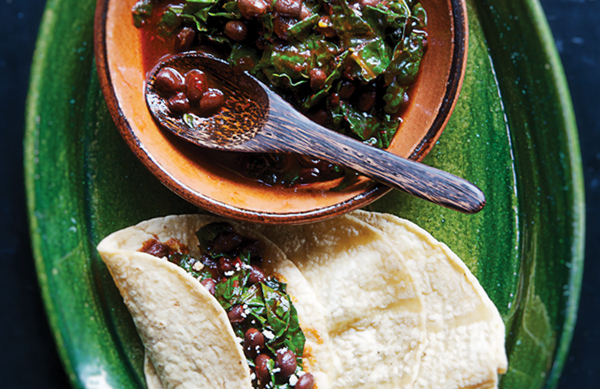 I’m talking about tried-and-true greens and beans and making them amazingly satisfying with a red chile sauce made from the bright, earthy flavors of dried guajillo chiles and garlic. Spoon the mixture it into a warm tortilla, sprinkle on some crumbled fresh cheese and each bite of these tacos feels so comforting, so iconically Mexican, that it’s like a big warm hug from your Mexican grandmother. Think that’s overstating it? I don’t. Heat the oil in a large (4-quart) saucepan over medium. One or 2 at a time, fry the chiles until they’re aromatic and change color (they’ll lighten a little on the inside and brown on the outside), 10 seconds or so on each side. Remove to a bowl, cover with hot tap water, weight with a plate to keep them submerged and rehydrate for about 20 minutes. Set the pan aside. Scoop the chiles into a blender jar, along with 2/3 cup of the soaking water. Return the oily pan to medium-high heat. When hot, set a medium-mesh strainer over the pan and press the chile mixture through. Discard the skins and seeds left in the strainer. Cook, stirring nearly constantly, until the consistency of tomato paste, about 4 minutes. Pour in 3/4 cupwater, reduce the heat to medium-low and simmer, stirring regularly, until the sauce takes on a medium consistency, about 5 minutes. Taste and season highly with salt, usually about 1 teaspoon; adding about ½ teaspoon sugar will bring out the natural fruitiness of the chile and balance the heat a little. guajillo sauce. Cook, stirring often, until the kale wilts, about 3 minutes. Transfer themixture to a warm serving bowl. Sprinkle the queso fresco on top and you’re ready to serve. If you’re like me, that’ll include plenty of warm tortillas for making tacos. 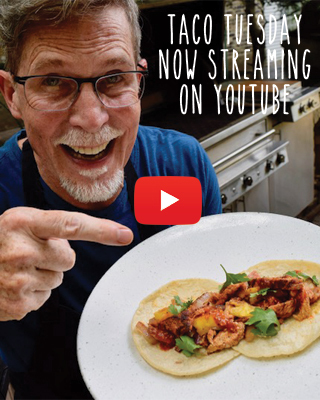 I just watched Mexico one Plate at a Time on the create channel. I only saw the tail end when Rick was making crepes and he showed these squares of greens and custard. also. Then he said you can find all recipes on the website. I could not find the recipe. Hi MaryJo, We’ll take a look and respond here, OK? Thanks for watching! Looking for the frijoles charros, (Charros beans) he made this morning! I’ve been craving it all day. I love this recipe – and if you blend it more than the recipe states it makes an amazing dip!